Prior to starting Keto we had been vegetarians for close to 3 years, and we still like to have 1 or 2 days per week where we don’t eat meat. This would appear to be a bit of a challenge on Keto at first glance, but it’s actually much easier than you may think. We sub out animal protein for extra firm tofu and add in some additional fats. Most vegetarian meat replacements are lacking in the fat department, so a couple tablespoons of coconut oil or ghee can get your meals back on track. We will also use packaged meat replacements from time to time. There are a number of good low carb options that pack a good amount of protein and 2-4g of net carbs per serving. 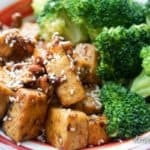 This Almond Tofu recipe however, has been one of our go to Vegetarian dishes for years now and we’ve made the necessary tweaks to convert it to keto! This is without a doubt the most important step. You HAVE to press out the tofu to get all the moisture out. If you omit this step you will not be able to get the tofu to crisp up in the pan. We wrap extra firm tofu in a few paper towels and set it on a flat plate. Then we place our heavy cast iron skillet on top. You can also set another plate on top and put some books on it. Anything to get a good amount of pressure on the tofu to get all the water out. We love incorporating nuts into our asian stir fry dishes and this spicy almond tofu is no exception. They add a much needed crunch, and pair perfectly with tofu. You can use any type of nuts interchangeably in this dish. We LOVE this dish with cashews! Almonds are better if you are trying to keep the carbs down. We’ve also done peanuts, pecans, walnuts and brazil nuts in the past. They all work pretty well and the decision is yours depending on your nut preference. Even try mixing in a few different types of nuts. This dish hinges on the crispness of the tofu, and to make sure we get it nice and crispy we are going to need to use high heat. Get a skillet, crank it up to the max, throw in some oil(we use coconut oil) and once it’s up to temperature toss in the tofu. On high heat it will take about 2 minutes per side to get a nice golden brown color. Add the chopped almonds. Allow them to cook in the pan with the tofu on high heat for 1-2 minutes so some of the natural oils and nuttiness are released. This adds a lot of flavor to the finished product. Now we add the seasoning! Don’t be afraid of flavor! Add more seasoning than you normally would if you were using chicken or beef. Tofu is hard to penetrate with seasoning so a little extra is needed. Once all the seasoning is added and evenly distributed add in 2 tbsp of water(so the soy sauce doesn’t burn in the hot pan) and then add the soy sauce. Cook on high heat until all of the liquid is reduced down and you are left with tofu that is nicely coated with flavor! Serve over some steamed broccoli and top with sesame seeds, sesame oil and more chopped almonds if desired! Press the tofu. Wrap tofu in paper towel and place on a flat plate. Place a pan/skillet on top of the wrapped tofu in order to apply pressure and force out the moisture. Dice the tofu into 1 inch cubes and slice the almonds. Melt 1 tbsp of coconut oil in a skillet over high heat. When the oil is up to temperature add the tofu cubes. Allow the tofu to cook on each side for 2 minutes or until golden brown and crispy. Add the almonds to the pan when the tofu is nearly completely crispy. Allow the almonds to cook on high for 1-2 minutes with the tofu. Allow the spice blend and soy sauce to reduce all the way down until no liquid remains. You should be left with tofu/almonds that are coated with the spice blend. Optional: 30 seconds before removing from the stove add in your favorite hot sauce. We use Green Dragon Chili Sauce from trader joes. Any sauce will do though. Some other options are Chili Garlic Paste, or traditional Tabasco sauce. Serve over steamed broccoli. Top with the remaining sesame seeds and additional chopped almonds if desired. Drizzle with 1 tsp of Sesame Oil. Enjoy!